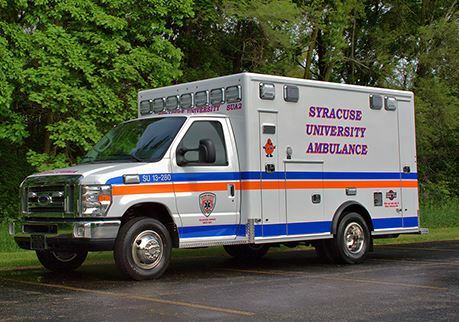 Syracuse University Ambulance (SUA) has invited the Syracuse University community to join SUA in celebrating National Collegiate Emergency Medical Services during the week of Nov. 9. Syracuse University Ambulance will celebrate National Collegiate EMS Week the week of Nov. 9.
by the American College of Emergency Physicians, and endorsed by Congress. Participating in EMS Week is a way for campus-based EMS organizations to highlight their services and provide education to the community. SUA will be tabling at Schine Student Center from 10 a.m.-2 p.m. This event will focus on vitals/CPR awareness, including free blood pressure screening, hands-on CPR, and a demonstration of the Zoll AutoPulse® Resuscitation System. An Alcohol Awareness Event for Sadler Hall will be held in collaboration with the Residence Hall Association (RHA), Be Wise and Peer Advisors from 8-9:30 p.m. Weather permitting, SUA will be presenting an Emergency Vehicle Exposition next to Hendricks Chapel from 10 a.m.-1 p.m. This event will showcase one of the ambulances as well as the mass casualty incident (MCI) trailer. Vehicles will be open for walkthroughs and questions with SUA members. An Alcohol Awareness Event for Booth/Kimmel/Marion Halls will be held in collaboration with RHA, Be Wise and Peer Advisors from 8-9:30 p.m.
SUA will continue Vitals/CPR Awareness tabling in the Life Science Complex Atrium from 10 a.m.-2 p.m.
SUA will cosponsor a Blood Drive through the American Red Cross with the Center for Policy Research and SU Red Cross Club in 204 Maxwell Hall from 10 a.m.-3 p.m. All donors will receive a commemorative Red Cross T-shirt in honor of Veteran’s Day. For more information, contact Peg Austin to make an appointment at mmaustin@maxwell.syr.edu or visit http://redcrossblood.org (use sponsor code: giveblood@SU). An Alcohol Awareness Event for Brewster/Boland/Brockway Halls will be held in collaboration with RHA, Be Wise and Peer Advisors. SUA invites all interested community members to tour its headquarters at 111 Waverly Ave. from 5-8 p.m.
For more information on the November 11th blood drive, please contact Peg Austin to make an appointment at mmaustin@maxwell.syr.edu or visit redcrossblood.org (use sponsor code: giveblood@SU).